After being forced off the bike with injury for the first time, the past couple of weeks have been a learning experience. I’ve learned how to manage the post-crash experience, from insurance issues to wound management, to keeping focus on a return to riding. 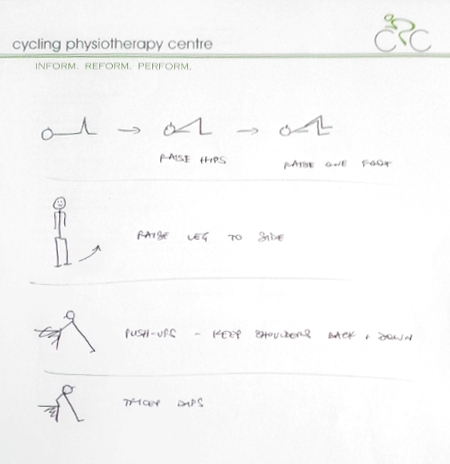 If you ride hard, you’re going to hit the floor at some point, so hopefully some of my insights can be of some use! It’s one think to know you shouldn’t thrust your hand out when you come off, it’s another to remember as you’re falling. I like the Cycling Secrets video tips on this subject which you can watch here. In my case, it happened so quickly that I’d impacted my shoulder at essentially the same moment I realised I’d lost the bike, so I had no time for unhelpful self preservation instincts to interfere with technique! Whilst I sustained a fracture to the greater tubercle, this was an undisplaced (the bone remained aligned at the break) avulsion fracture. Avulsion fractures occur when the muscles are exerted in a moment of such force that they pull a piece of bone away. The upshot of all this is the amount of healing time required is much less than if you suffer a displaced fracture, like a snapped collar bone. Don’t leave home without a phone. In my case a motorist arrived and helped only moments after my call to Katrina but it could have been worse. Make sure you have ambulance insurance! Here’s the link for Victorian cyclists. Go and do it right now if you haven’t yet! Having the bill on top of everything else right now might be more than my typically upbeat self could cope with. Wear gloves! After my slip ‘n slide on the road my hands told the story of the gloves I was wearing. I wore short fingered gloves and whilst my palms were completely unhurt, the tips of my fingers were covered in little cuts and I lost a piece of fingernail off my right thumb. Ambulances aside, our public health system will still give you most of what you need for free. I tried to do a back-of-the-envelope calculation on how much my day at the Austin would have cost the system – the wages of doctors and nurses and X-ray guys, and drugs, and general hospital running costs etc. It would have been several thousand dollars at least, which I’m glad I didn’t have to pay. I have my bike insured with Velosure. I did this unhesitatingly, and I have the power meter, race wheels, and Garmin insured with them on top of the bike. They’ll cover you in just about any situation, and provide some cover for non-medicare health costs like physio too. The bike came out of the crash OK. 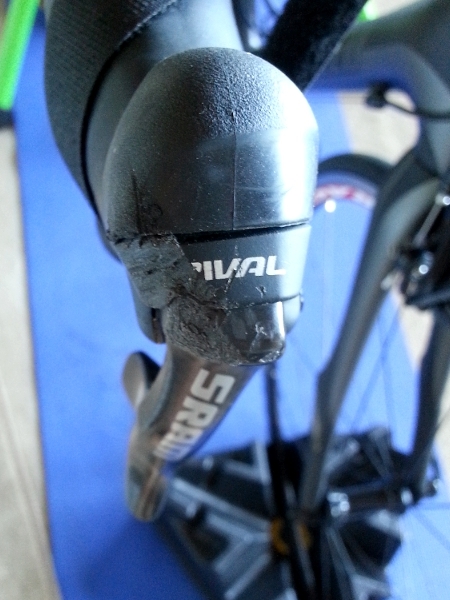 The hoods, brakes and shifters took a pounding on both sides, the rear derailleur hanger was slightly bent (but only obvious when attempting to index the gears later), the left side of the saddle got scratched up and the rear quick release got ground down about 5mm. But there was no frame damage at all. Everything seemed functional, and this would be an exclusion for having insurance replace any crash damaged component. Still, I wasn’t sure the shifters weren’t going to fall apart as a result of the damage so I ran the idea of replacing them past Velosure. A mangled shifter. One of two. I was told I’d have to submit photographs and then they’d make a determination, and that the excess on parts was $250. After a moment of online window shopping I found I could replace the shifters for basically the same price as the excess. So there was no point claiming the damage, but what about the medical costs? For non-medicare health costs like physio, Velosure will cover up to $1000 with the standard $250 excess. I was considering this, then I realised I had another option. 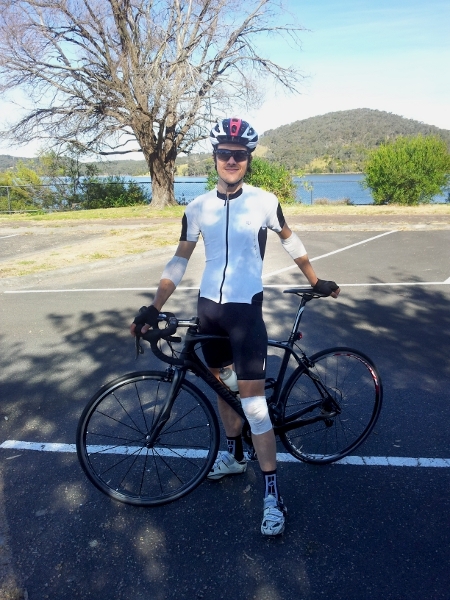 If you’ve got a Cycling Australia (CA) licence you also have personal injury insurance attached. CA will cover 80% of costs up to $5,000 with a mere $70 excess and no impact on your subsequent licence costs. After a phone call to CA it became abundantly clear that their injury insurance was the one to use. So armed with all the right forms I went ahead and booked my physio appointment. At the end of my appointment I asked when I should return and I was told, ‘if you’re having problems in a fortnight you could come back.’ There was no implication that I should be returning automatically, although the physio could easily have made a buck out of me if he had suggested this. I really appreciated this, as my previous experience with a physio involved ongoing and costly appointments until I finally tweaked that it was unnecessary. The appointment only cost $70 so I still hadn’t equalled the expense of the CA excess, and it was no longer clear that I’d need any further treatment. On both counts, bike and body, insurance proved unnecessary. So whilst not having insurance is a gamble, taking insurance out is also a gamble of sorts. Whilst the fracture might count as the most significant injury, as far as getting back on the bike was concerned it was somewhere down the list. Within 48 hours I could get on the trainer without too much strain on the arm. I could only raise it about 30 degrees from my body though, so road riding wasn’t an option. More of a problem were the many abrasions and lacerations that were weeping and requiring regular dressing changes, and a mysterious soft tissue injury around my left hip. I had to work through these issues on the trainer, but by New Years Eve I had more range of motion in my arm and I was determined to get back out. 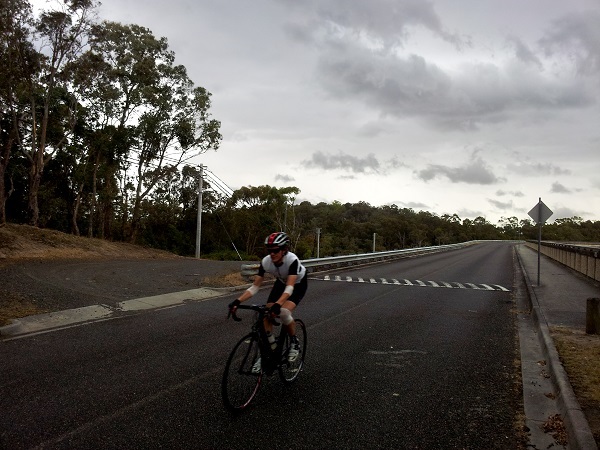 Katrina drove me out to Sugarloaf Reservoir and I rode a cautious 15km up and down the flat dam wall as the sun set. I’m glad I didn’t end my road cycling year lying down!